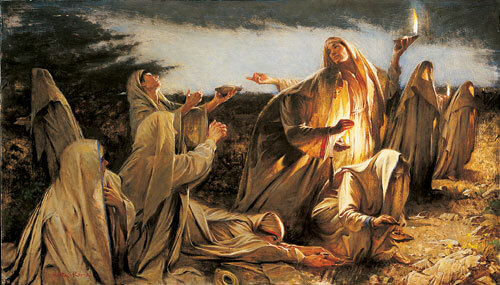 We had a good discussion in class about the ten virgins, since they are referenced in Doctrine and Covenants 45. We took a look at the story as told in Matthew 25 and examined verse 12. The JST changes this verse to “ye knew me not”, putting the emphasis on us to know Christ. Many students did not know that the virgins represent the Church. This story illustrates our natural tendency to put off what we know we need to do now until some far off future time. The foolish virgins knew what they needed to do, they just believed they should do it later. How do the youth of the Church behave like this today? Another point that illicited some discussion was the idea that the wise virgins could not give the oil to the foolish. There are just some things we cannot do for others. A great hook to make this relevant to the youth that I used was the TV show The Biggest Loser. I like the contestant from a few years ago from Missouri named Marty. Marty did not win the big prize, but he did win the game of life. His body is a reflection of the effect of daily work and dedication to changing his physical stature. We likened this in class to our spiritual bodies – each act of kindness, every prayer adds to our spiritual stature.